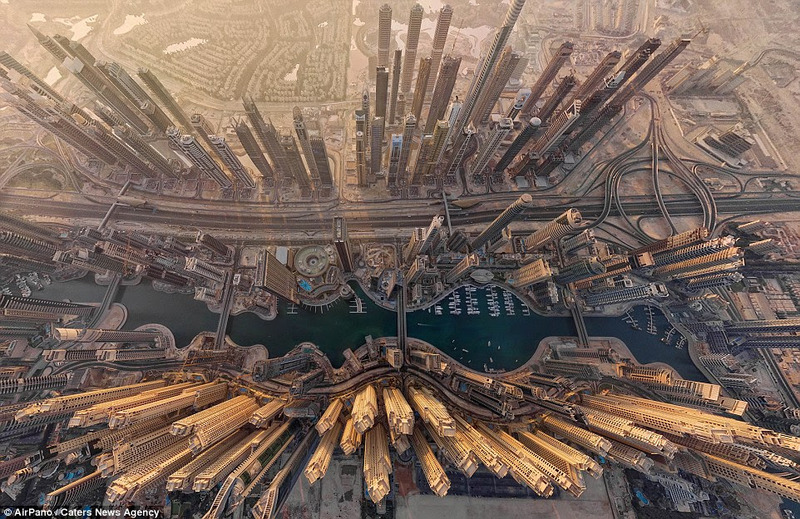 Dubai never ceases to impress, but this aerial shot of the skyline by AirPano shows the city in an incredible new light. 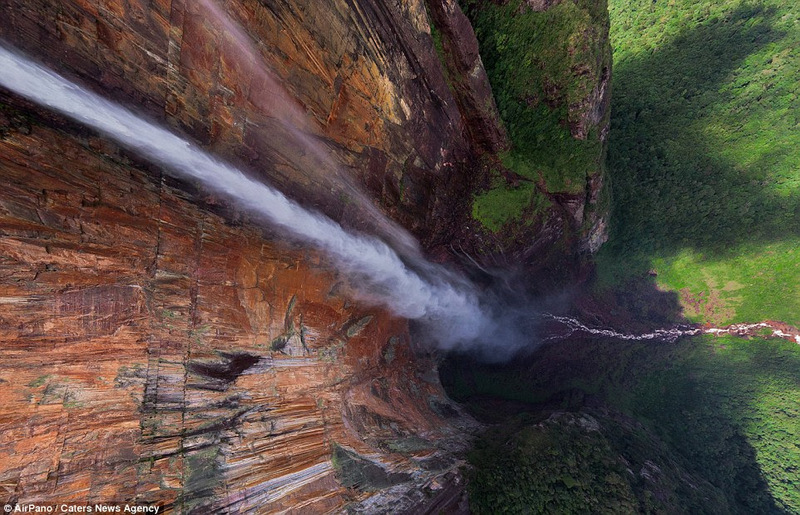 Only a photograph from above like this one can demonstrate the vast size of the Angel Falls in Venezuela. This perfectly ordered city is Barcelona in Spain-captured in the middle is the famous Sagrada Familia church. 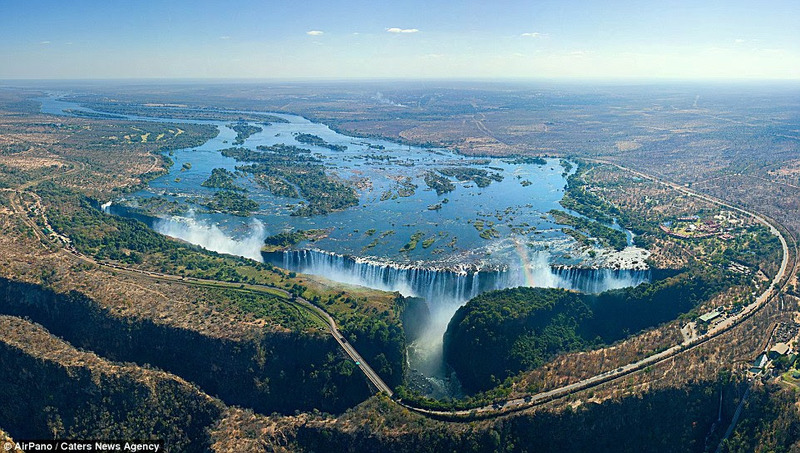 A perfectly captured picture of the Victoria Falls in Zambia. Iguacu Falls, Argentina, is just one of the stunning aerial shots shown off in AirPano’s spectacular collection. Winter wonderland! A stunning photo of Mount Everest, Earth’s highest mountain, located in the Mahalangur section of the Himalayas. New perspective! 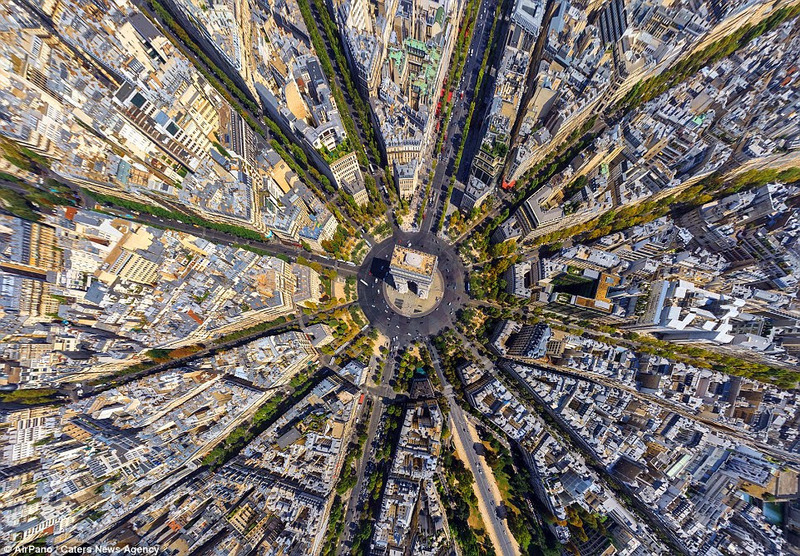 It could confuse at first, but this is actually the Arc de Triomphe in Paris, photographed entirely from above. Concrete jungle lit up! 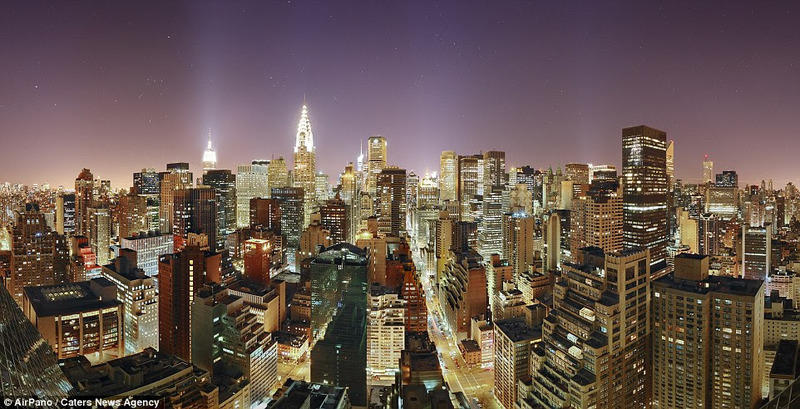 A magical panoramic shot of Manhattan City Line at night, with the Empire State Building gleaming to the left and the Chrysler building towards the center. 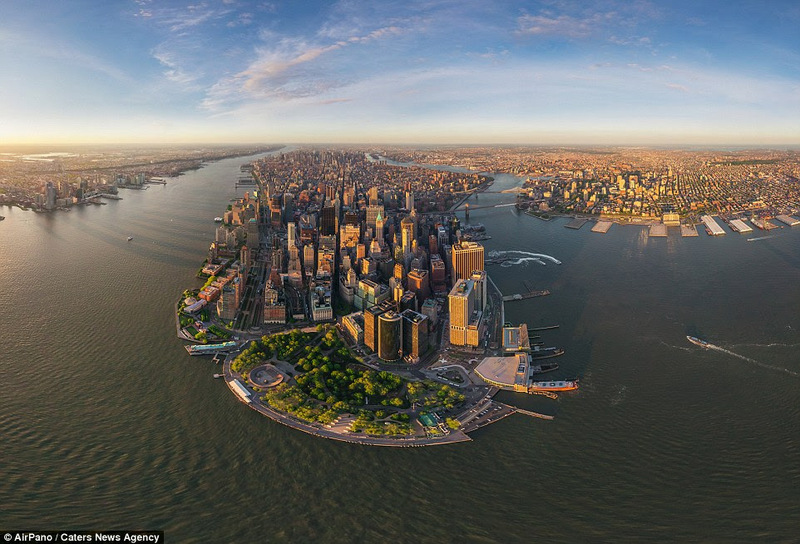 AirPano perfectly shot Manhattan in New York, with views for miles stretching out in the background. Looking down, down under! 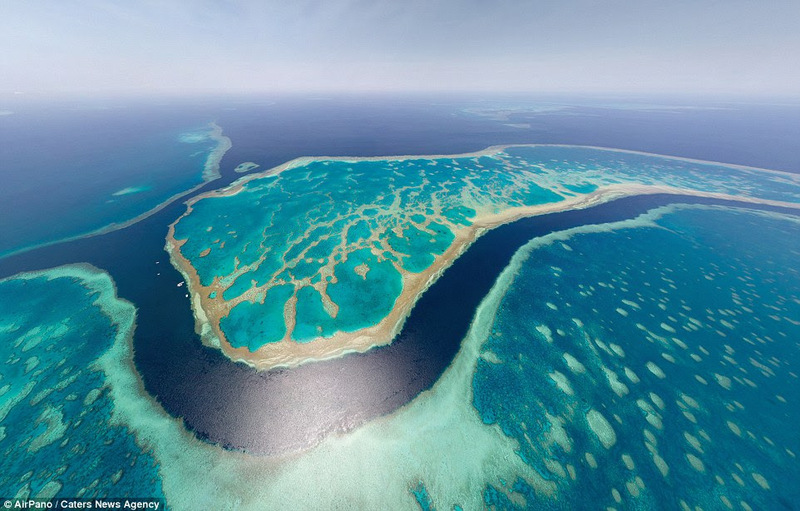 Australia’s barrier reef looks a brilliant shade of turquoise in this landscape capture. 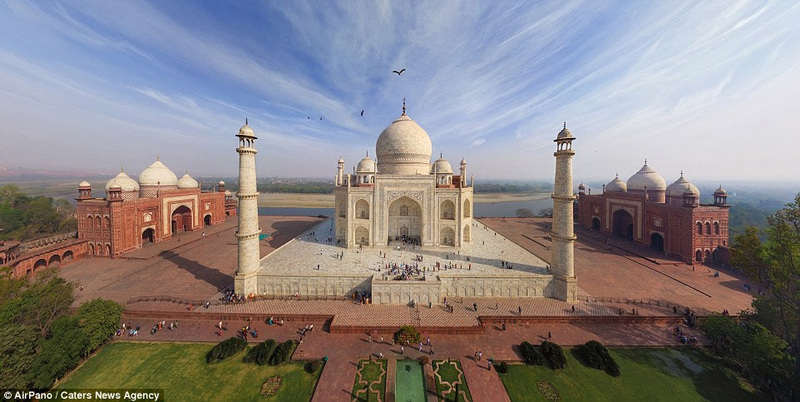 See the Taj Mahal from a new angle! The Indian landmark has been captured many times before, but the team took a new perspective. One of the spectacular wonders of the world from above. The Ha Long island dotted in the Vietnamese bay. Flecks of white in the blue ocean, frozen Iceland as you have never seen it before. The team mainly use drones to take their photographs. 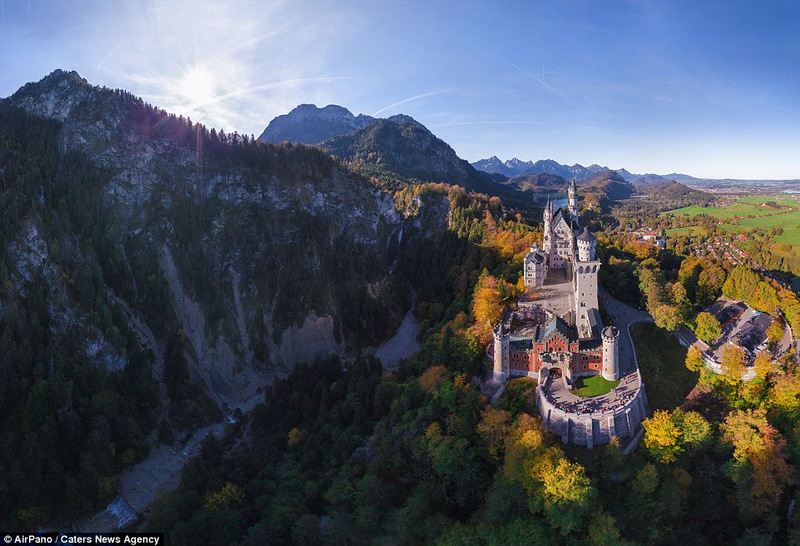 Looking like something out of a fairy tale is Neuschwenstein Castle in Germany, captured in the midst of the rolling mountains. The Pyramids in Egypt made AirPano’s 100 Best Places on the Planet list, which the team set out to capture over the years since they started in 2006. Project coordinator Sergey Semenov revealed that after initially working with spherical panoramas on land, the group decided to take to the skies. Pictured here is the Singapore Flyer. Speech is human and as shallow as time. Silence is divine – yet also brutish and dead. Silence is the element in which great things fashion themselves. It is more eloquent than words. It is as deep as eternity. Therefore we must cultivate both arts. Secrecy is the element of all goodness; even virtue, even beauty is mysterious. Humor has justly been regarded as the finest perfection of poetic genius. Music is well said to be the speech of angels. In fact, nothing among the utterances allowed to man, is felt to be so divine. It brings us near to the Infinite. The three legendary Poets of Urdu literature are Ghalib, 1797 – 1869, Iqbal, 1877 – 1938 and Faraz 1931 – 2008. Here they present in their couplets their opposing views on the Universality of God. It was not a feud but rather a poetic difference of opinion between highly intelligent and witty minds and which spread across Centuries. Ghalib started it in the 19th century. It was a bold statement but then Ghalib was never known for meekness or following the crowd. Zahid, sharaab peene de masjid mein baith kar Ya wo jagah bataa, jahaan Khuda nahin. Let me drink in a mosque; or tell me the place where there is no God. Allama Iqbal was not convinced and decided to reply about half century later – in late 19th – early 20th centuryl. His poetic reply to Ghalib. Masjid Khuda ka ghar hai, peene ki jagah nahin Kaafir ke dil mein jaa, wahaan khuda nahin. Mosque is the abode of God, not a place to drink. Go to the heart of a non-believer because there is no God there. Faraz had the last word in latter half of the 20th century. Kaafir ke dil se aaya hun, main ye dekh kar Faraz, Khuda maujood hai wahaan, par usey pata nahin. I have returned from the heart of the disbeliever and I have observed: God is present in his heart too, but the person just does not know it. Ever come across Jewish Proverbs? Here are some from the Race that has, percentage wise, produced more Nobel Prize winners, than any other! The wise man, even when he holds his tongue, says more than the fool when he speaks. Imagination is more important than knowledge.
. What you don’t see with your eyes, don’t invent with your mouth. A wise man hears one word and understands two. .. A hero is someone who can keep his mouth shut when he is right. One of life’s greatest mysteries is how the boy who wasn’t good enough to marry your daughter can be the father of the smartest grandchild in the world.
. “Don’t be so humble – you are not that great.” . Pessimism is a luxury that a Jew can never allow himself. .. Any intelligent fool can make things bigger and more complex. It takes a touch of genius – and a lot of courage to move in the opposite direction. Intellectuals solve problems; geniuses prevent them. You can’t control the wand a lot of courage to move in the opposite direction. We can’t solve problems by using the same kind of thinking we used when we created them. Let us see if you can figure out what these seven words have in common? Well apart from a letter or letters being repeated, the fact is that if the first letter is taken and placed at the end, then the same word can be read backward. ‘Stewardesses’ is the longest word typed with only the Left Hand and ‘lollypop’ is the longest word typed with the Right Hand. No word in the English language rhymes with ‘month’, ‘orange’, ‘silver’, or ‘purple’. ‘Dreamt’ is the only English word that ends in the letters ‘mt’. There are two words in the English language that have all five vowels in order – ‘abstemious’ and ‘facetious’. tremendous, horrendous, stupendous and hazardous. Here are proverbs from the race that, percentage wise, has produced more Nobel Laureates than any other! And a few observations from the recent Great of that Race! If the rich could hire other people to die for them, the poor could make a wonderful living. What you don’t see with your eyes, don’t invent with your mouth. A hero is someone who can keep his mouth shut when he is right. You can’t control the wind, but you can adjust your sails. Any intelligent fool can make things bigger and more complex. It takes a touch of genius – and a lot of courage to move in the opposite direction. The guy who made up this sentence is a many splendoured genius! The first word has one letter, the second has two letters, the third three letters and so on till the twentieth word is with twenty letters! All Religions preach the same stuff. Yet they are all at war with one another and are responsible for much of the bloodshed and suffering. Here is how the Dalai Lama defined true religion when some Smart Aleck tried to trip him up by asing which was the Best Religion. The Best Religion is the one that gets you closest to God. In other words which makes you a better person. Whether you are religous or not is not important. What is important is your behavior in family, at work, at play, in your community and outside – indeed every where and all the time. Your personal universe is the echo of your thoughts and actions. The law of action and reaction is also true in your relations with others. Goodness will beget goodness and evil will beget evil. You will always have what you desire as long as you desire the same for others. Happinnes is not a matter of destiny – it is a question of options. Because your thoughts will become words. Your words will become actions. Your actions will become habits and your habits will become character. And your character will become your dsstiny. And destiny is life. There is No Religion Higher than Truth. You cannot multiply wealth by dividing it! That also goes for esteem, pride, ambition or confidence! When half of the people get the idea that they do not have to work because the other half is going to take care of them, and when that other half gets the idea that it does no good to work because somebody else is going to get what they work for, that is the beginning of the end of any nation. Dr Devi Shetty, the noted Heart Surgeon, was personal physician to Mother Teresa. He was on the BBC Hard Talk Programme recently where he held his own when being hammered about his life aim of reducing cost of Heart Surgery to One Thousand Dollars! Here he shoots from the hip as he answers common Qs re Heart and Health. 1. Diet – Less Oil and Carbs. More Protein. 2. Exercise – At the least a Half Hour Walk Five Days a week. Climb steps and Avoid lifts. Avoid sitting for more than half hour at a time. 3. Quit smoking 4. Control weight 5. Control Blood pressure and Sugar. Q: Is eating non-veg food (fish) good for the heart? This is called silent attack; that is why we recommend everyone past the age of 30 to undergo routine health checkups. Change your attitude towards life. Do not look for perfection in everything in life. Q: Does cholesterol accumulate from an early age or only after30 years age? You tend to eat junk food when habits are irregular and your body’s enzyme release for digestion gets confused. Control diet, walk and eat walnut. Fruits and vegetables are the best and oil is the worst. Routine blood test to ensure sugar, cholesterol is ok. Check BP, Treadmill test after an echo. Help the person into a sleeping position, place an aspirin tablet under the tongue with a sorbitrate tablet if available, and rush him to a coronary care unit, since the maximum casualty takes place within the first hour. Q: How do you differentiate between pain caused by a heart attack and that caused due to gastric trouble? Q; What is the main cause of a steep increase in heart problems amongst youngsters? People of 30-40 yrs age have heart attacks and heart problems. Sedentary lifestyles, smoking, junk food, lack of exercise in a country where people are genetically three times more vulnerable for heart attacks than Europeans and Americans. Q: Is it possible for a person to have BP outside the normal range of 120/80 and yet be perfectly healthy? Q: Marriages within close relatives can lead to heart problems for the child? Yes, co-sanguinity leads to congenital abnormalities. Q: Many of us have an irregular daily routine and many a times we stay late nights in office. Does this affect our heart? What precautions would you recommend? When you are young, nature protects you against all these irregularities. As you grow older, Respect the biological clock. Q: Will taking anti-hypertensive drugs cause other complications (short/long term)? Yes, most drugs have side effects. However, modern anti-hypertensive drugs are extremely safe. Q: Will consuming more coffee/tea lead to heart attacks? Q: Are asthma patients more prone to heart disease? Q: How would you define junk food? Fried food like Kentucky , McDonalds , Samosas, even Masala Dosas. Q: You mentioned that Indians are three times more vulnerable. What is the reason?Europeans and Americans also eat a lot of junk food? Every race is vulnerable to some disease and unfortunately, Indians are vulnerable for the most expensive disease. Q: Does consuming bananas help reduce hypertension? Q: Can a person help himself during a heart attack? Yes. Lie down comfortably and put an aspirin tablet of any description under the tongue and ask someone to take you to the nearest coronary care unit without any delay. Do not wait for the ambulance. Q: Do low white blood cells and low hemoglobin count lead to heart problems? No. But it is ideal to have normal hemoglobin level to increase your exercise capacity. Q: Sometimes, due to hectic schedule we are not able to exercise. So, does walking while doing daily chores at home or climbing the stairs in the house, work as a substitute for exercise? Avoid sitting continuously for more than half an hour continuously. Even the act of getting out of the chair and going to another chair helps. Q: Is there a relation between heart problems and blood sugar? Yes. A strong relationship. Diabetics are more vulnerable to heart attacks than non-diabetics. Q: What are the things one needs to take care of after a heart operation? Diet, exercise, drugs on time. Control cholesterol, BP, weight. Q: Are people working on night shifts more vulnerable to heart disease when compared to day shift workers? Q: Does dispirin or similar headache pills increase the risk of heart attacks? Q: Why is the rate of heart attacks more in men than in women? Nature protects women till the age of 45. Present Global census show that the Percentage of heart disease in women has increased more than in men. Q: What are the modern anti-hypertensive drugs? There are hundreds of drugs and your doctor will chose the right combination for your problem. My suggestion is to – Aoid the drugs Go for walks. Diet to reduce weight. Change attitude and lifestyle. Q: How can one keep the heart in a good condition? Eat a healthy Diet. Avoid junk food. Exercise every day. Do not smoke. Go for health check ups – if you are 30, at least once in six months.